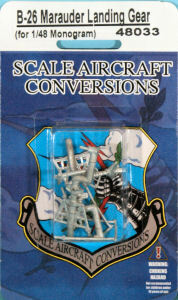 This release is one of more than 60 landing gear sets available in 1/48 scale and is targeted for the Monogram releases of their B-26 Marauder. You can see the nicely cast strut assemblies which are drop-in replacements for the Monogram kit. This set includes replacement main struts, nosegear strut, and retraction arms. This set will work in any of the Revell, Monogram, and Pro Modeler boxings of this kit as well as the Hasegawa re-boxing of this tooling as well.